The nuclear power industry is staging a come-back, especially in Eastern Europe. Plans that were made during Soviet times are now back on the agenda in many countries and there are plans to build some 20 new nuclear reactors in the region. For the past years, the grassroots foundation has supported anti-nuclear movements in Western and Eastern Europe as well as Russia. And in many cases our support has been crucial to the success of civil rights campaigns. The support of campaign activities in Western Europe with the aim of preventing the financing of nuclear projects in Eastern Europe. The support of local anti-nuclear movements in Eastern Europe and Russia. Strengthening the links between groups in Western and Eastern Europe. One of the key efforts that grassroots has supported over the past years, is an international campaign against the Belene nuclear power plant (NPP) in Bulgaria. Belene is not only the first of the new NPPs in Eastern Europe to apply for financing, it is also one of the most dangerous projects, as it would be built in an area of high seismic risk. Its design is still based on plans from Soviet times and after the fall of the iron curtain it was shelved due to public protests and negative expert assessment. The latest controversy about Belene is of great strategic importance since this case will decide how far Eastern European plans for new NPPs will be realized with the help of western banks and investors. Grassroots has therefore awarded several small grants to Bulgarian NGOs, working both in the Belene region as well as at the national level. When it emerged in 2006 that German and Italian banks were planning to fund Belene, grassroots also supported campaigns by NGOs in these countries to take their banks to task. 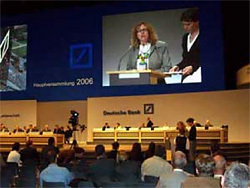 This enabled the German NGO, urgewald, to bring activists from Bulgaria to the shareholder meetings of Deutsche Bank, HypoVereinsbank and Commerzbank and to mobilize over 10,000 protest postcards from concerned citizens to the banks. In October 2006, the Italian bank, UniCredit was then targeted in a Europe-wide action day, with protests in 13 countries in front of its offices. At the same time, groups in Germany were gearing up to a nation-wide action week with protests in 60 cities against the Belene project. In October 2006, the banks gave in – and withdrew from the project! Vienna. On Friday, the 13th of October 2006, protest actions took place in 16 European capitals against the UniCredit bank. The focus of the protests was Eastern Europe. Students demonstrate against Belene in Tuzla. Then, however, RWE, Germany's second largest energy company, planned to invest in the Belene project. So grassroots decided to continue financing the campaigns of urgewald and other organizations. 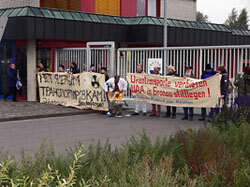 At the RWE shareholders meeting in 2008 these NGOs exerted considerable anti-nuclear pressure with their campaign called FINGER WEG (Hands off!). Nevertheless in July 2008 RWE made a bid for a 49% share of the controversial power plant and the bid was accepted in October 2008. The contract still had to be signed by the board of directors. But owing to a number of different activities (e.g. letters to members of the board, campaigns in municipalities holding RWE shares, demonstrations and press releases) a majority for an investment in Belene on the board could be prevented and the decision was postponed. Then, for the first time, grassroots helped to finance an NGO campaign that concentrated on the board of directors and the personal responsibility of every single member of the board and the shareholders. In cooperation with urgewald and Campact! 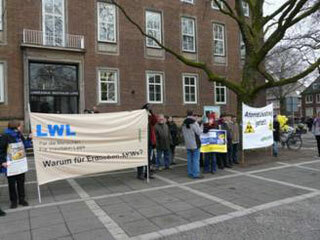 protest demonstrations were organized in front of the RWE headquarters in Essen before each meeting of the board. In addition to that big posters with the slogan "Nuclear power stations in earthquake zones - who makes them possible?" were displayed, on which the mayors of towns holding RWE shares were cited by name. Albena Simeonova, one of Bulgaria's leading environmentalists, speaks out against Belene at the shareholder meeting of Deutsche Bank. 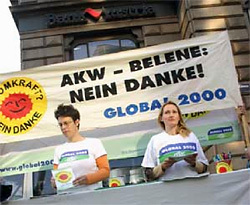 After the big earthquake in Bulgaria and Romania in March 2009 a protest action week was organised in 50 towns against RWE and its biggest single shareholder, the Allianz Company. In April 2009, on the occasion of the RWE shareholders meeting, the NGOs invited the environmental activist Albena Simeonova and the former director of the Bulgarian nuclear supervisory authority, Dr. Kastchiev, to back up the anti-nuclear cause. An extensive public relations campaign accompanied these activities. This campaign, funded by grassroots, made a huge impact: In October 2009 RWE withdrew from the project. The Belene campaign has thus sent important signals to Western banks – that citizens and customers do not want to see new NPPs constructed in Europe. There is, however, another important source of funding for nuclear power in Europe and that is the Euratom Facility. One of the focal points of our program has been the support of local NGOs in Russia, where the government aims to build 40 new nuclear plants. Grassroots has supported over 40 projects in Russia over the past years, ranging from action camps against individual NPPs to national campaigns against the import of nuclear waste. One of the highlights in this area is the URENCO campaign. Since 1996, the Russian nuclear industry and the European company URENCO has been transporting radioactive waste from the uranium enrichment plant in Gronau (Germany) to closed nuclear cities in Siberia. Only 10% of the uranium is re-enriched in Russia and then returned to URENCO. Although Russian law forbids the import of radioactive waste, 90% of URENCO’s waste stays in the country and all information is kept secret because Russian enrichment plants are part of the governmental weapons industry. Cooperation of russian and german antinuclear movements. Our partner, Ecodefense, made the radioactive waste trade from Germany public in 2005 for the first time and organized protest demonstrations all along the transport routes from St. Petersburg to Ekaterinburg. The story caught the attention of the media and around 20 million Russians found out about this illegal importation of radioactive waste. Ecodefense continued to organize protests in various cities across Russia, and also started cooperation with the German anti-nuclear movement. There were protests against the last transportation of radioactive waste from Gronau on both sides – in Western Germany and in Russia. Ecodefense also appealed to several regional prosecutors in Russia to halt these illegal nuclear activities. This provoked an investigation by the regional prosecution office in Ekaterinburg – which is still ongoing. Another result of the protests, was that the head of the St. Petersburg regional parliament demanded a stop to the use of the city’s sea-port as a transit place for radioactive waste. In June 2006, the governmental news agency RIA NOVOSTI published the news that Rosatom (the governmental nuclear power agency) may re-think the policy of importing uranium tails. In the meantime the Russian Government has announced that nuclear waste transports from Urenco to Russia are to end in 2009. 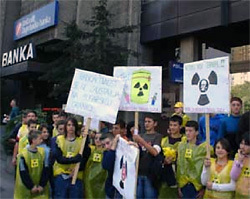 In 2005 and 2006 grassroots supported NGOs in Eastern Europe, which used the 20th anniversary of the Chernobyl catastrophe as an opportunity to demonstrate the dangers of nuclear energy. In Bulgaria, members of the BeleNE! anti-nuclear coalition organized a debate tour in key university towns and held a vigil in front of the Ministry of Economy and Energy, which is in charge of nuclear power stations. In the Ukraine, the NGO “Ecoclub” organized an energy tour of the country, calling for a new sustainable energy policy and a stop to nuclear power. The tour covered 1800 km in 8 days and press conferences and public exhibitions were held along its route. As a result, the new version of the national energy-strategy of the Ukraine envisages that 20% of the energy requirements of the country shall be covered by renewable sources. The previous version earmarked only 8%. In Russia, a broad NGO coalition organized over 2000 events throughout the country, holding seminars, protest actions, vigils and press conferences in all major cities. Over 150 articles appeared in newspapers and magazines and there were over 70 radio- and TV-reports. According to our estimation, nearly 10 million people received the distributed information. Financial support of NGOs in Western Europe and of anti-nuclear campaigns in the EU. The Italian energy concern ENEL is the most aggressive European player with respect to the expansion of nuclear power in Eastern Europe. About 30% of ENEL belongs to the Italian state. With the support of grassroots CBRM initiated the campaign “Stacca la Spina” (Pull out the plug). On the 20th anniversary of the referendum which was held on November 8th 1987 (in which 70% of the Italian population had voted against nuclear power) CBRM organized demonstrations in front of Italian embassies all over Europe to protest against the nuclear plans of ENEL. At these demonstrations there were speakers from NGOs in Slovakia and Bulgaria, two countries where ENEL has nuclear power projects. CBRM has revived the anti-nuclear-movement in Italy and, together with other NGOs, directed a joint campaign not only against ENEL but also Italy’s biggest bank, Unicredit. Consequently Unicredit was put under pressure to adopt a relatively strict policy for the financing of nuclear projects. With the help of grassroots the dangerous nuclear plans of the ENEL reached a wide public and pressure could be put on parliament and the banks. As a result of the Belene Campaign (see above) five German and eight international banks have refused to finance this controversial project. In 2008 a widespread public campaign against the RWE was mounted, which led to the RWE withdrawing its support in October 2009. The wholefood shop campaign to encourage customers to switch to green electricity was developed with the financial support of grassroots, too. The public pressure, the customer campaign and the appearances at shareholders meetings forced E.on to abandon its plans to invest in nuclear power stations in the East. Currently, conditions for the nuclear power sector are changing. Large energy companies are trying to use the climate discussion to renounce the nuclear phase-out in Germany. Finland and France have decided to build new nuclear power plants. And the pro-nuclear lobby is managing to put NPPs back onto official agendas in Slovakia, Romania, Lithuania, Bulgaria and many other Eastern European countries. Thus, the need for a consistent and concerted effort by the international anti-nuclear power movement and the foundations who support it is apparent – possibly more so than ever before. © The grassroots foundation is a non profit limited company.